and see even more products! Mitchell Roundhand Nibs come without a reservoir. 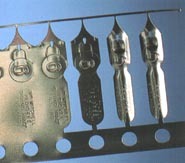 It is possible to use these nibs without the reservoirs in smaller sizes, but difficult in the larger sizes. Size 0 is the largest of the Mitchell Roundhand Nibs and as the number increases, the nib size decreases. My favourite sizes are the #2 (I start all my students with this size) and a #3 1/2. 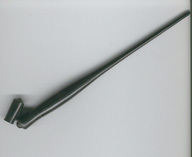 With Mitchell Roundhand nibs, the reservoirs are bought separately. I always buy a reservoir to go with every nib I buy! Once I get a nib and reservoir perfectly matched they remain together for life. This is just a little blurb I wrote about Mitchell nibs.... I tried to make it free, but PayPal said NO! The No40 is sold out. Sorry! 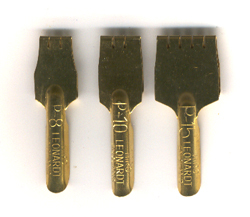 Plakat Nibs - Steel brush gold plated folded metal nib for making large letters. You may print this out for your reference. 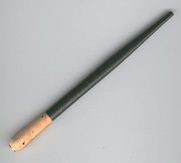 Simple and precise script pen with a medium fine point and a large reserve of ink. My all time favourite. It's sharp and flexible!